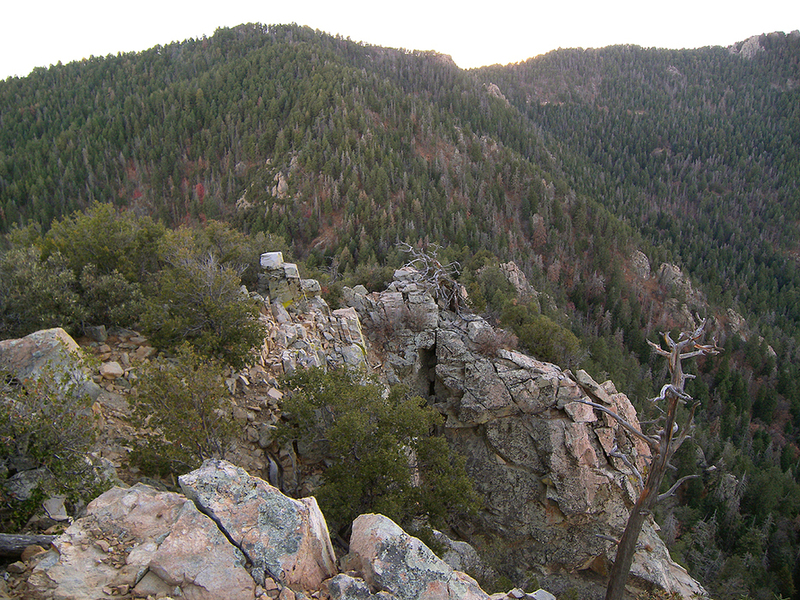 Overview: Peak 8359, which is apparently known as Mount Baldy by locals, is a rather rugged point rising above Turkey Flat in southeastern Arizona's Pinaleno Mountains. Views from the top are outstanding, as is the norm for these mountains. 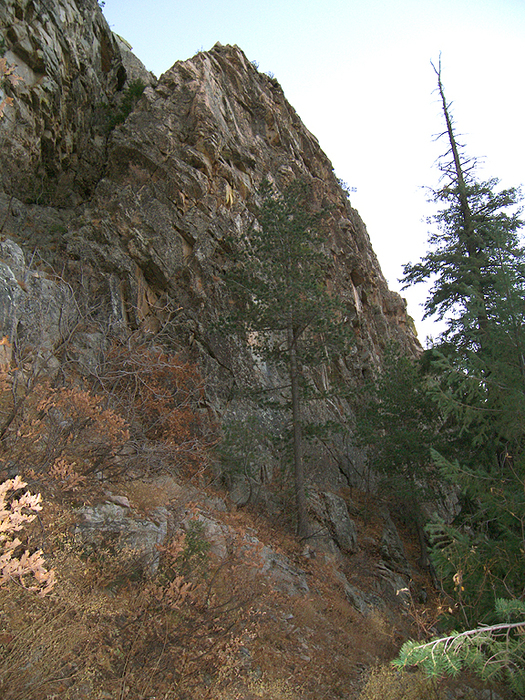 While the Ladybug Trail passes directly below the summit's cliff face, no trail leads to the top. Mt. Baldy is a relatively easy peak to bag though, with only a little bushwhacking required. Hike: Start hiking up Turkey Flat Trail #330 from it's beginning at milepost 128 along the Swift Trail, in the Turkey Flat summer cabins area. Alternating views of rugged mountains and distant desert will draw your eyes away from the ground in front of you while hiking. The trail gradually climbs the forested mountain side before reaching a saddle at 0.5 miles, where it meets the Ladybug Trail. Turn right and head up the ridge on the Ladybug Trail #329. The Ladybug Trail rolls along the top of the ridge and passes another saddle before beginning a steep switchback climb up a rocky corner of Mt. Baldy. The ascent eases up around the 8100 foot level, where the trail leaves the ridge to contour along the slope below the peak. This is a good place to start the bushwhack to the top (I left the trail at 32.62930 N, 109.81283 W). If you reach the cliff that rises high above the Ladybug Trail, turn around and go back about 500 feet. Leave the trail and pick your way up through the brush, trees and boulders, staying close to the ridgeline. The top soon comes into view and the oak brush opens up to reveal a small, bald, rocky summit. This is a great place to relax and take in the far reaching views of southern Arizona. An ammo box containing a summit register is buried in a rock pile. Beware of the sheer drop off at the summit's edges. When you are ready to leave, be careful to retrace your steps so as not to cliff out on this rugged peak. From Safford, head south on U.S. highway 191. Turn west onto state highway 366 (Swift Trail). Follow highway 366 approximately 13.7 miles to the Turkey Flat trailhead at milepost 128. The parking area is a pull-off spot along the road, with room for maybe 3 cars.